Ships from Hong Kong. This elegant beaded headband offers the ultimate look when the occasion calls for style and grace. 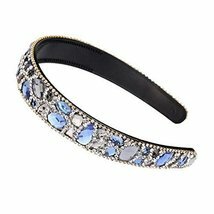 Also, this sweet style hair band make you charming and attractive. It is made of bling bling rhinestone and plastic. Prefect for daily use, especially for wedding or party. Both stylish and practical. It is your best choice. Suitable for personal wearing or gift idea for friends and your love one. Don't miss it!